Angry Birds, that game you've had on all of your past few smartphones (but haven't really bothered with since 2012) is being made into a movie, out in May. 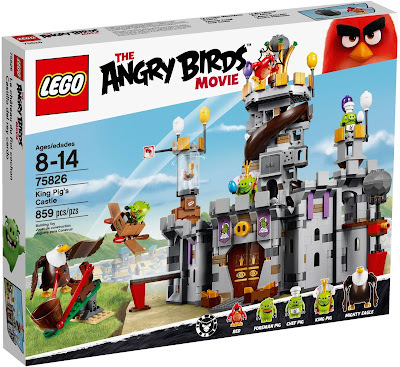 Because of that, our dear Danish friends at LEGO have brought out a whole new range of Angry Birds-themed sets, which are both play sets and games in their own right. We delve into the fold with King Pig's Castle. You get (from L to R) Mighty Eagle, Red, Foreman Pig, Chef Pig, and the boss himself, King Pig. Despite the new moulds all these figures (including the Mighty Eagle) have stud-friendly feet, and the smaller characters have conventional LEGO minifigure arms and hands. King Pig is probably our favourite of the bunch, with his crown and fabric gown, which is made from the same stuff as the new heavy-weight capes we've seen LEGO Batman in recently. Mighty Eagle is also pretty noteworthy due to his size. The wings can move (and come off), while his beak is made from a soft rubbery plastic. The first part of the build is this little catapult - essential for any game of Angry Birds. While not an actual sling-shot, it certainly looks like one, and requires a short sharp whack to the front to get Red airborne. When he is, however, he can go quite far. Although it looks like one solid building, the castle is actually made from two free-standing elements; the tower and the battlements above. Constructed in three parts, the battlements feature a few awesome play features and details,and after building it our LEGO-nostalgic minds were cast back to the old Knights and Forestmen sets of the late 1980s. The left most section features lots of places to stand the green piggies (and then become targets for Red), as well as a stack of TNT boxes and a rotating case with a cupcake and wine goblet inside. Notice the little runway lower down? Hit a plunger on the back and out pops Foreman Pig in his wooden glider, no doubt to 'ham'per our dear chum Red. Tee hee. Moving on to the right, the central section is feature-free but has some really cool details. The 'nose' brick is printed, but the flags and door details are stickers. Fortunately this is the only place that stickers really feature, as apart from the firework sticker, and the front detail on the glider (and some very subtle texturing in the tower) King Pig's Castle is relatively sticker-free. Nice. ... the toilet. This is by far our favourite part of the whole build. Obviously. ... bottom, via a basketball net, no less. In use this process is a bit hit and miss, which actually makes the game element of the set a bit more exciting and random. The tower is filled with detail. There is a regal perch for King Pig, and lots of seemingly random cupboard doors and inlets. The whole thing is pretty higgledy-PIGgledy. Tee hee again! But our second favourite detail of the set is to be found at the base of the tower - the piggies' break room! Cans of soft drink and cupcakes are on the menu today, and all three can fit in there to toast the King's good health. 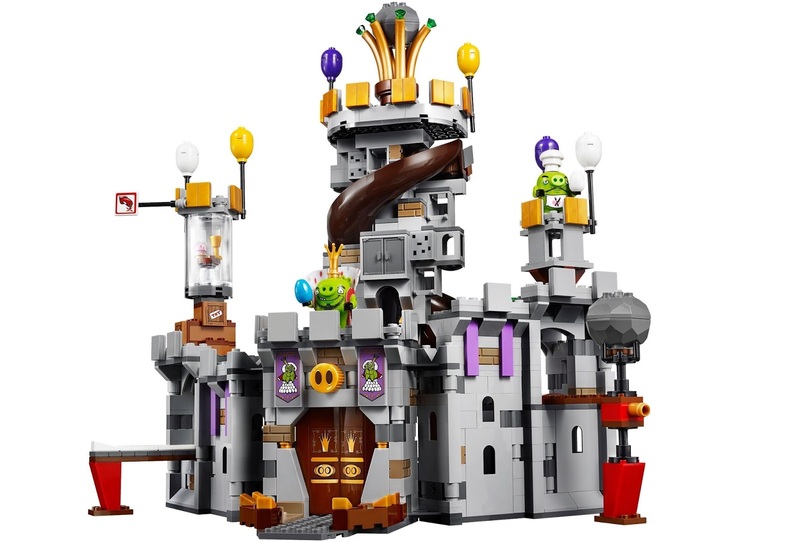 LEGO Angry Birds King Pig's Castle is a fun set that combines imaginative play with a tricky game. At first we felt a bit disappointed that the tower and battlement sections were separate, but in doing so the designers have allowed kids to move things around to make more challenging targets. And, because it is modular, you could always tinker with the layout to make to another castle fit for a (pig) king.